Ok, as you can see the street was pretty busy and I only saw glimpses of this gentleman as he made his way down Madison Ave.
At first I couldn’t decide what I thought but ,like a picture coming into focus, the closer he got the more intrigued I became by his look and swagger. Once I got a full view I could immediately tell everything was too perfect to have been “just thrown together”. Just as much as a Savile Row suit this look is all about fit. The cardigan and shirt are the perfect length, the pants are perfectly personalized, the shoes well-aged, and the hat! – don’t get me started at how perfect his pose must reflect his personality. This man has style in his bones. We really didn’t talk much after I took the shot but I could just tell he must be a “somebody”, but who? To me, that is almost as romantic a job as being a famous artist. Wow, I like this … Had once a shirt with of patchwork. One of my favourites. Imagine this guy’s pants with a tight jacket, shirt and tie. Absolutely amazing. Yes, before reading the end of your entry, I was going to say that he looks like he works at Ralph Lauren. The patchwork look is all the rage in the coming seasons. Ah, the trained eye… Love the way you describe how you focus into style. That’s what I love so much about taking streetstyle pics. You spot a certain style, have a split second to decide whether to take a picture, and (sometimes) end up with a fascinating personality like this gentleman. But a closer look revealed the intricacy of choices, as well as their quality. I’m not sure the patches really work, though–something a little more finished is required,I’d say…. Before reading your entry, I assumed this man to be homeless! Definitely the “studio rat” look — whether he’s involved in the arts or not. Don’t get me wrong, I like it. I want to commend you *highly* for your attentiveness to a wider range of ages and personal styles than we usually see in the media. So brilliant! Eccentric chic. What I like about the photo, however, is the dude in the background to the left with the tangerine tie who looks all morose that you didn’t chose him, Sart. Oh what a character! I love it! AT LAST – SOMEONE WITH CUFFS! Sart, your intuition is amazing! This man has my dream job! Wow… you have an amazing ability of capturing both great style and great story… Most people would simply walk past this man and thought he was a bum or something, but you managed to find a truly Hemingway character :) Thank you! I normally HATE patchwork, but his pants are done very nicely. Does anyone out there know if they’re actually made by a designer? Umm… does he look homeless to anyone else? Wonderful image: he looks commanding and totally in character in between all the nonsense movement around. 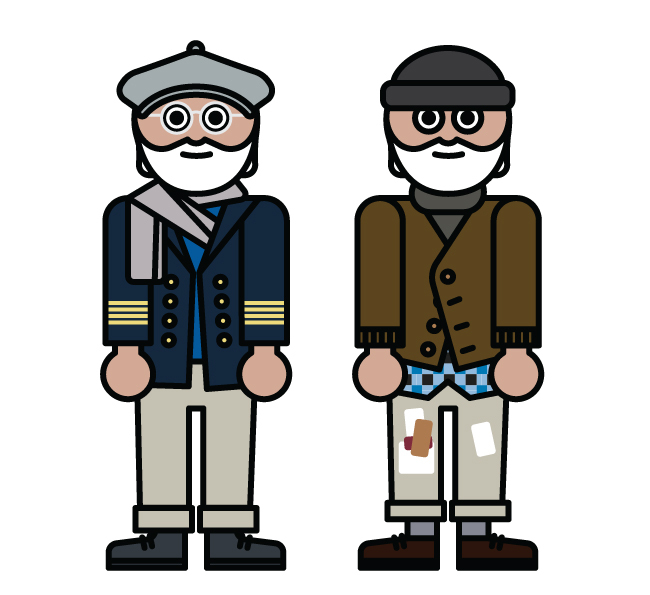 He reminds me of a sailor, yeah Hemingway too, but more a sailor than a writer, regardless on how many other people might find this wearable or descent. He seems as wise as to have been in remote lands. I wonder if you did not mention his status in the fashion world some would say that he is all but acceptable, what a pity. I really like this look, it’s my favourite one together with the painter. I like how he’s looking so good without wearing garments that are very nice by themselves. It’s all about the matching here. Definitely something I would wear! I am very impressed that you acknowledged the fact that he actually had not just thrown it together. Youre good “Sart” :) Btw, love the look, the hat=Amazing! It takes a discerning eye to pick out someone who planned this look from the average bum. Congrats on spotting him and teaching us about what is going on. I absolutely adore how individual this guy’s style is. All the elements mix perfectly but in a “I just threw this on” kind of way. What a dream job that would be. Love the patchwork pants. Uptown grunge! That is a cool job he has! Amazing photo, Sart! The artfully applied patches proves his look is thought-through and not a homeless interpretation of Anthony Quinn. Your eye for detail is astounding — I would’ve not made anything of his shirt and cardigan lengths. And doesn’t this prove that location and context is everything? In the nice parts of Los Angeles, unless he were carrying an artist’s brush or camera, his look would inspire fear (how crazy is he?) and inevitable police scrutiny (even with camera, where was it stolen from?). Maybe that’s a sad comment on LA, but perhaps that underscores a cultural difference between the coasts. want that job and want to adopt that man! what a find! how marvelous! His name is Doug Billmeir….. and he’s the real deal…. not a poser. He knows vintage forwards and backwards….. has an awesome eye…… and is a great person. One of Ralph’s go-to guys. To me he looks more like a sailor (I find the Hemingway comparison very cool and accurate) than an art connoisseur, but you can see that he definitely doesn’t lack personality. At first I thought he was homeless (! ), until I saw how artful the patches on the pants are. I agree, very Ralph Lauren. Reminded me of Ernest Hemingway, but now I think that he’s just a fashionable interpretation of the writer! Still, what a great job to hold. I am sorry i just can’t see out of my little box…..while i see some of the details you pointed out SAR….i still find it hard to appreciet from the standpoint of looking appealling or attractive. you truly do have a great eye — i would have been reaching into my pocket for a buck to give him and hoping he wouldn’t throw up on my coat ;-) but when you stop and really LOOK at him, all of the details you point out come into focus. the guy walking behind him in the orange tie and hat is pretty interesting, too. At first i thought he was an homeless guy who can dress with what he got. After giving it much thought, I m sorry but the pants don t work…The rest is fine though, and I do like the attitude…He reminds me of older bourgeois men in the South of France. Good style is often a result of coincidence in the form of experimentation, especially in regard to streetwear. I find that some of my best ideas come to me when I am simply throwing things together. I think he looks like he was pulled out of the movie Zoolander; from Mugatu’s “derelict” line. boho chic! now who wouldnt want this man’s job?…. I agree that would be such a fabulous job – i think every major designer has people who do just this – travel and collect stuff and inspiration. A good game to play while on the street (or stuck on the train) is “who’s that designer” where you see individuals like this guy and pick which designer was inspired by them. The Woolworth’s counter was always a good faux-fashion spot for this before it’s sad demise. Sart, my man, this explains why you have this job and I have mine. I would’ve never thought to give this young man’s sense of style a second look. I would’ve been patting down my pants pockets in search of a Zippo in which to light his square with. I’m dumbfounded that people have said this man seemed homeless to them. Talk about writing folk off at first glance. This gentleman is not only clean, neat and warm, he has put together a very clever, comfortable and individual look. His facial hair is groomed and his head is warm.The homeless folk in my neighbourhood, sadly, are very far indeed from being warm, neat, clean and groomed. Where on earth do you find street folk looking this good and so well taken care of? Take a pause folks, don’t be so quick to judge. “That’s the guy that heads Ralph Lauren’s vintage department.”? Sart, I have a bridge in Brooklyn that’s for sale…are you in? wow. and that’s one of the reasons why i want to move to the fabulous state of new york! Reminds me of the late Charles Bukowski a bit. lighten up, sweetie, and learn to pick your battles. this man has been compared to hemingway, an old salt, an art connoisseur, a studio rat, and a character out of zoolander, and the overwhelming majority of those of us who said he looked like a street person prefaced their remarks with “at first glance” as a way of emphasizing the importance of really leaning to look at things (and people) in order to actually see them. some of us are good at it, and some of us need practice which, speaking for myself, is one of the best reasons to come here and take a lesson from sart. I don’t believe in perfection, but I think he probably knows his clothes and can dress to be comfortable and express his own style. Just like the white cardigan guy in 30 yrs. of-effort-in-order-to-look-effortless look of stylish slobs everywhere to come back! My brother loves to sport this look; he’s a record producer for Sony in LA, and has bags of money, but he has ALWAYS (and I mean the last 20 years) insisted on wearing the most apparently non-descript and apparently ‘derelicte’ outfits. BUT, the man has an excellent eye (our mother was a fashion designer), and knows exactly what he’s doing with his bowling shoes, sweaters, pajama pants, etc. It makes for an interesting object lesson in human dynamics, to hear people’s reaction to this fellow’s similar look. ‘Wouldn’t have given him a second glance’, or ‘looks like a bum’. Sart has presented us with an opportunity to reflect on our own prejudices. A compassionate (or at least curious) eye can reveal wonders in the world around us. If you get past (or get into!) my brother’s appearance, you’ll find him one of the most lively and intelligent conversationalists you’ve ever met. I would imagine that the fellow in the picture would have a few tales to spin as well, and would prove a fascinating lunch companion. He clearly knows what he’s doing with his clothes, and probably doesn’t mind being overlooked by the herd, so he can go about his business undisturbed. I think Fashmoda has the right idea; patched pants with tight jacket and tie; beats fake ski resort patches on a $3000 Thom Browne suit! DIY! I have to admit, I thought he was a common hobo (Australian term for homeless person) on first inspection, however a second look, with the picture slightly enlarged, shifted my perception about the integrity/ value of what he wears. “travels the world”… has this man not yet discovered ebay for all his swag needs. You have such an eye for spotting style!!! !I guess with this guy it mus be really inate-we know he selected these items expecially and it was a considered choice but there is still a magic element that keeps it from being contrived. Amazing!! Hmm, usually i think you are spot on, but i just don’t get it here. To me it doesn’t look calculated sloppy; it just looks sloppy/grungy, esp the shirt and cardigan. not a fan of the pants, either! What are you talking about, people? Can’t you immediately tell by the turn-ups, the cardigan and the scarf that this look is thoroughly thought through? This is not an outfit – it’s a lifestyle, and boy does he pull it off. It’s real, it’s got soul. Just because the best tailoring you’ve ever seen is above your appendix doesn’t mean anything. I immediately thought: Writer. So I think I was channeling the Hemmingway vibe like others. Gosh I love your blog! Wow … this gentleman has spawned quite the debate. Sart’s main post said, “This man has style in his bones.” If that’s the case, I’d really like to see him in a formal wear, to see how his bones show through in that context! Vintagent christens this with a “derelicte” label, as though the French -e ending inparts a patina of haute couture to what looks more homeless/hobo than anything else ( and btw, I’ve run into homeless people who are brilliant conversationalists, so good talk is proof of nothing!). But if “style” means making a distinctive personal statement no matter what throw-aways you’re wearing, then I’ve learned something here. If he travels the world for RL do you think he dresses this way on the plane? it may also be a lifestyle, but it’s definitely an outfit. anything this calculated and styled is an outfit. um, i’m not sure that the issue is so much the amount of money spent, or the quality of the fabrics involved, or even conformity (although this entry is certainly on its way to unseating the infamous man-cape in terms of sparking the most controversy) but rather whether the look itself is original and wonderful or merely unconventional for the sake of unconventionality — is he an artist with real style or is he an attention-seeking rebel with no particular cause? the care and expertise with which he pulls off the look is without question, but there is absolutely room for legitimate debate as to the rest. you don’t have to be a label-junkie to not find him credible or dislike his choices, and i don’t think it’s quite fair to lump the dissenters into that category. in any event and imho, george bush is an emperor with no clothes, regardless of what he’s wearing. I’d have said sculptor, Yale or Princeton artist-in-residence. This look has its roots in 1950s prep school style. Fabulous! Too cool, you have a good eye for style. Ahhhh, thank you Sart for shooting this character. Seeing the photo of this gentleman is my dish of sorbet…the refeshing palate cleanser after the rich courses of dashing tailored men and the bevy of fresh faced beauties. Much has been analyzed to this man’s purposeful or accidental dressing. Personally I never saw a homeless persona. And I don’t really see a maverick who is trying to send a fashion message of rebellion either. I simply see a beautiful man with sharp wit and a keen sense of humor who really loves his clothes but even more so loves his freedom. As you brilliantly observed, this man has style in his bones. His life is more important than his closet. His search for treasure feeds him more than labels. He is a feast for the eyes and lively for the imagination. the more i look, the more i like it! The point, I think, is that all garments, alone or (particularly) in combination, evoke a response drawn from our experience of them. 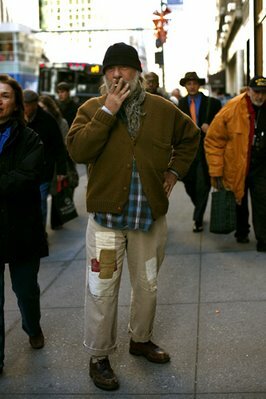 The guy’s watch cap pulled low over his forehead, the gray beard, and the “homemade” patches ring an associative bell for many city-dwellers: homeless person. But CLOSER INSPECTION reveals something else entirely. And when we recognize that something else, we begin to access and re-classify (literally) the person; and we’re likely to see sartorial intent. Then we decide if the look is successful or not based on what the wearer is attempting to do–and whether we LIKE what he’s trying to do or not. That issue is the “arena” for debate. i couldn’t disagree more. i don’t know about how much he cherishes his freedom, how he feels about labels, how sharp his wit is, or how much he values or doesn’t value his clothes — we all create images for ourselves to one degree or another, and the desire to control others’ perceptions of who we are is instinctive as well as learned. to say that he has “style in his bones” is probably quite true, but i don’t believe for a minute that he isn’t extremely discriminating and quite deliberate in his attire, has expertly crafted exactly the persona he wishes to project. that he recognizes his natural gifts, has been wise enough to develop them, and is able to put them to good use in his work is a wonderful thing, but i would never presume to know who he is, what he believes, or how he feels by what he wears. Dame, I knew you would disagree with me. You disagree with many posters and make certain to point that out. I am sorry that you take offense that a beautifully captured photo induces an entire world for me. Just as a work of art from a painterly hand will inspire a myriad of feelings and imaginings for the viewer, so does Sart’s photos for myself. I dont come here to necessarily pick apart every element of an outfit. I prefer to imagine a life behind the face…behind the outfit created. I could be completely wrong about this fellow but thankfully I live in a cyber world where I am allowed to dream. I choose to see this gentleman in the way I previously described. I prefer, for myself, to weave a story around the way someone chooses to express themselves from their image. I would much prefer to sit across a table from him and learn that way but since I cant, I wont. We all size people up from their appearance whether we admit it or not. He chose a romantic, worldly field of work. He choses a unique, bohemian way to style himself…As someone who has dealt in antiques and vintage clothing knows, it takes a little wit and romance to find the treasure.I prefer to see him as a romantic hero who loves his freedom. We all see with our own eyes. Dame, perhaps you dont care to admit that you do it yourself as well. Your first comment included the remark “i would have been reaching into my pocket for a buck to give him and hoping he wouldn’t throw up on my coat ;-)”. I dont know how this is different than my own instincts to his possible nature or personality…or why he dressed in that particular ensemble on that particular day. You went on the reveal that as you gave him more of a look your view changed. My dear, that’s what it’s all about. You have the freedom to make up your own mind and so do we all, whether anyone agrees with it or not. I didnt say I thought he looked like a serial killer. It strikes me as odd that you find fault in the personal opinions of others. To Sart…Thank you again for created a voyeuristic world of the every day person that allows us to capture the beauty you see thru your lens. You have definitely found your calling and we are truly blessed by it. wit – The way he positions himself…taking a drag from his cigarette during the photo…his field of work. sense of humor – the patches on his trousers…and something in his eyes. freedom – He looks like no one else on the street. He looks like no one else on this blog. My last paragraph includes my personal ideas as I ended it “He is a feast for the eyes and lively for the imagination” with the key word being imagination. I do hope I am still allowed that. How many posters comment on their opinion of someone’s provence simply by their hair or pant length? Dear Dame, that’s the fun…using your imagination. What are you rabble discussing? This chap has style. It’s obvious. Stop it now. Some of the most stylish people in London are tramps. And I’m not being ironic. What I’m saying is, if that if he works for Ralphy then he’s got style; if he’s homeless then he’s got style. Get some style. Ciao. good heavens, i merely said that i disagreed with you, which i do quite deliberately because i find these comments to be much more interesting when there is an occasional exchange of ideas and opinions rather than just an up or down vote. the remark about hoping he didn’t throw up on my coat was an admittedly feeble attempt at humor, albeit one drawn from an actual experience i had one day on the street, which became funny only in retrospect. i am a dealer in vintage clothing, but obviously one of those who unfortunately possesses neither the wit nor the romance to do it well. how i have managed to survive at it for the past twenty-five years is a mystery, but perhaps one day sart will take a picture of me, post it here, and you can tell me more about myself and what it is i should be doing instead. Dame, I would be happy to. are you nay-sayers serious? have you ever even seen a homeless person before? let alone a homeless person wearing artfully arranged patches on spotlessly clean chinos? me neither. this man is a perfect character. I love his stance . . . there’s nothing about that stance that says “homeless.” He’s a character I would like to know a little more about. Here’s what we’re talking about…a guy who’s spent his life fine tuning on the details and has it down to a fine art. The colours, the textures, the perfectly proportioned turn-ups, but first and foremost, he just looks so damned relaxed! obvious style. he separates style + trend. enough said! This is so fantastic…and right up my alley! I love the patches on the pants, the cardigan, just everything! He's setting his own trend!! He's a very pleasant man actually…very cool. If anyone is familiar with the Ralph Lauren brand, RRL carry's the vintage inspired clothes that you see him wearing! Doug actually finds these amazing japanese indigo fabrics that have been used in pcs in the RRL line. You won't see a website for the line but there are stores located in the East Coast and West Coast. Just found the blog. He dresses like my grandfather. It is about comfort, it is about the material, how it feels to the touch. He is someone who is supremely comfortable in his own skin, and that shines through! I was Doug’s assistant for a year or so in 1987. His idea of coming in to work late was like 4:30. A joy. Would love to meet the guy. Its good as your other content : D, appreciate it for posting . Hi there, of course this post is genuinely pleasant and I have learned lot of things from it on the topic of blogging. thanks.